(Phys.org) —A pair of researches with Kyoto University has found how the queen of one species of termite, Reticulitermes speratus, ensures her genetic lineage continues by creating duplicate copies of herself. In their paper published in Proceedings of the National Academy of Sciences, Toshihisa Yashiro and Kenji Matsuura describe the study they carried out that showed how queens in such colonies reproduce themselves. Scientists have known since 2009 that R. speratus queens created fatherless offspring which became queens themselves, but until now, the mechanism by which that came about has been a mystery. In this new effort, the researchers took a new look at the structure of the eggs laid by the queen to discover the difference between future queens and ordinary termites. Close inspection revealed tiny channels through the outer lining of the eggs called micropyles. The channels serve as an entry point for sperm, which the queen deposits on the eggs (after obtaining it from a male). Interestingly, the research pair found that the number of micropyles for any given egg appeared to be random, from one to more than thirty—the average was nine. Even more interesting was that the team soon learned that sometimes there were no micropyles at all in some eggs, which would of course mean that no sperm could enter to fertilize its contents—and the egg still matured and wound up in the creation of offspring. That offspring, because it had no DNA from a male, grew into a new queen. Such a process means that the females are fully in control of both sexual and asexual reproduction. Further study revealed that the queen only produces eggs with no microplyes when she gets older (females live on average for 11 years) thus, they serve as a means of queen replacement in a colony. This form of asexual reproduction called parthenogenesis is not unheard of in the animal kingdom—several other types of insects, lizards and even sharks use it as a form of reproduction. But this was the first time it's been seen in termites as a form of self-cloning. The authors note that because the offspring that are born as clones eventually reproduce themselves too, and so on and on, the original queen can be considered genetically immortal. Males and females are in conflict over genetic transmission in the evolution of parthenogenesis, because it enhances female reproductive output but deprives the males' genetic contribution. For males, any trait that coerces females into sexual reproduction should increase their fitness. 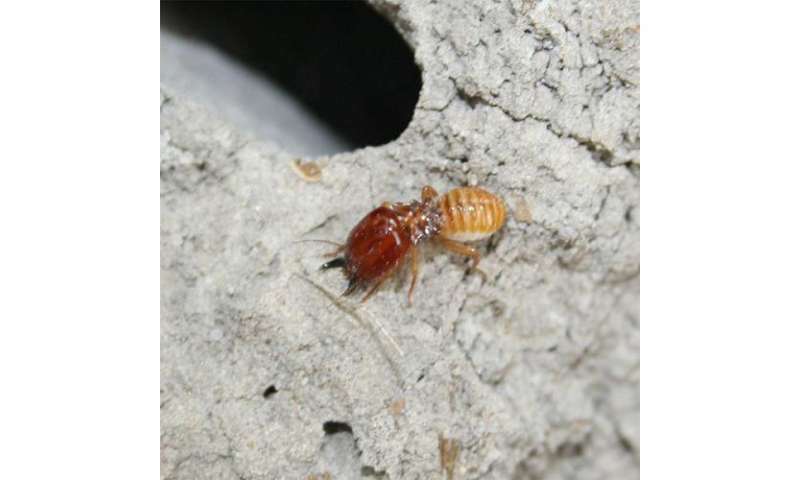 However, in the termite Reticulitermes speratus, queens produce their replacements (neotenic queens) parthenogenetically while using normal sexual reproduction to produce other colony members. Here, we show that termite queens produce parthenogenetic offspring in the presence of kings by closing the micropyles (sperm gates; i.e., openings for sperm entry) of their eggs. Our field survey showed that termite eggs show large variation in numbers of micropyles, with some having none. Microsatellite analysis showed that embryos of micropyleless eggs develop parthenogenetically, whereas those of eggs with micropyles are fertilized and develop sexually. Surveys of eggs among queens of different age groups showed that queens begin to lay micropyleless eggs when they are older and thus, need to produce their replacements parthenogenetically. In addition, we found clear seasonality in new neotenic queen differentiation and micropyleless egg production. This micropyle-dependent parthenogenesis is the first identification, to our knowledge, of the mechanism through which females control egg fertilization over time in diploid animals, implying a novel route of the evolution of parthenogenesis in favor of female interests without interference from males.